* The original wired XBOX 360 Controller is needed when used for XBOX 360 game console. 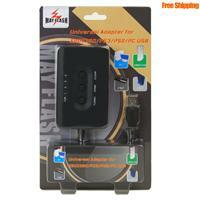 * Compatible with Windows 98, ME, 2000, XP, Vista and Windows 7,windows 8 ，32 bit and 64 bit. - Hold the button “Turbo”, and press the destination key, the Turbo function of the destination key will be available. Hold the button “Turbo”, and press the destination key again, the Auto Fire function of the destination key will be available. Press the button “Turbo” twice within 0.5 second, all Turbo functions will be cleared. - Hold the button “Clear”, and press the destination key, the Turbo function of that key can be cancelled. - Button 1-8 can be assigned to Turbo when used for PS3 game console or PC. 2. The HOME button on the adapter works as the PS button when used for PS3 game console, and the Guide button when used for XBOX 360 game console. - LED 1, 2, 3, 4: Each time you turn on the XBOX 360/PS3 console or PC, a LED number must be assigned to your controller. When the controller has been assigned a LED number, the LED indicator for the assigned number turns on solid red. - TURBO LED: When the destination key is assigned to Turbo, the TURBO LED will flash once you press the destination key. 4. Supports vibration when used for XBOX 360 and PS3 game console. The vibration is only available on PC after you install the driver.